Maximum Drawdown (MDD) is a very important measure of investment risk. It measures the largest percentage drop in the value of a portfolio from a peak to a subsequent bottom before that portfolio value makes a subsequent new high. 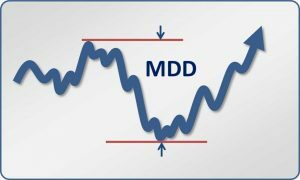 Each peak to bottom drop is called a drawdown, and the MDD is the largest drawdown of them all. For example, consider a $10,000 portfolio that is invested in 2004. Let’s say it goes up to a peak of $13,000 in late 2007, and then loses $6,000 during the financial crisis, hitting its lowest point in 2009 at a value of $7,000. It then recovers to make a new high of $15,000 by 2014. In the above example, the Maximum Drawdown was $6,000 in dollar terms or, in percentage terms, it was $6,000 / $13,000 = 46%. In other words, the portfolio lost 46% from peak to valley before starting to recover, and it occurred between 2007 and 2009. To be a meaningful investment risk measure, MDD should be considered over a fairly long period of time – like at least a decade. This is to ensure that the portfolio has gone through at least one full economic cycle, and therefore had the opportunity to suffer through at least one major bear market.